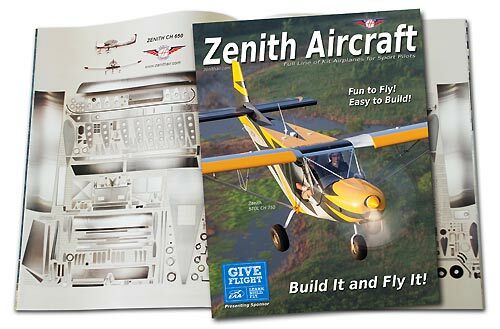 We've published a new Zenith Aircraft magazine, chock-full of information on building and flying your own Zenith. This free 48-page full color magazine provides an excellent introduction to the world of recreational flying and kit aviation, and covers all Zenith aircraft kit models with great photos of Zenith planes around the world. Contact Zenith Aircraft Company to have a free copy mailed to you, or download your copy now. Includes bonus footage: designer Chris Heintz interview, HomeBuiltHELP.com and STOL-Adventures previews and numerous new builder photos. 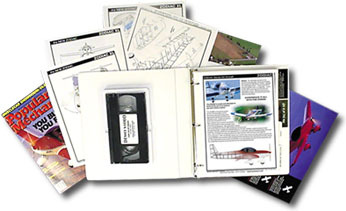 Information Kit: Detailed Information Manual on the short take-off and landing sport utility kit aircraft, loaded with aircraft and building information and photos, including professional Demo Video. Packaged in 3-hole ring binder. Cost $35.00 (including domestic priority mail). International Orders: add $10.00. STOL Series Information Manual: Detailed Information Manual on the short take-off and landing sport utility kit aircraft (STOL CH 701, 750, and STOL CH 801), loaded with aircraft and building information and photos, prices, ordering information, flight reports, and more. 60+ pages, full color. Packaged in 3-hole ring binder. Cost: $15.00 (included in above Information Kit). International Orders: add $10.00. Demo Video on DVD: Exciting new Demo Video shows Zenith kit aircraft in flight and under construction. Next best thing to flying the aircraft! Cost: $20.00 (included in the Information Kit above). "The Zenith literature package is easily the most complete package I have received from any light aviation company, and I’ve seen many other good ones among the hundreds I have studied. Lots and lots of information is presented with some lovely graphics. The literature alone is impressive, but the volume of information will keep you reading for hours. You can get a good idea of what you're buying without ever leaving your chair." 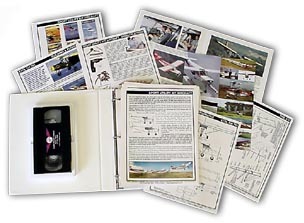 Information Kit: Detailed Information Manual loaded with aircraft and building information and photos, including professional Demo Video (DVD). Packaged in 3-hole ring binder. Cost $35.00 (including domestic priority mail). ZODIAC Information Manual: Detailed Information Manual loaded with aircraft and building information and photos, prices, ordering information, flight reports, and more. Packaged in 3-hole ring binder. Cost: $15.00 (Included in above Information Kit). International Orders: add $10.00. To Order: Call, fax, email, or write Zenith Aircraft Company: Orders for information materials may be charged to VISA or MasterCard. Information requests are fulfilled within 24 hours, and sent Priority Mail (domestic) or Air Mail (international). All prices in US funds. Register and Login to the exclusive "builder resources" section of our website.